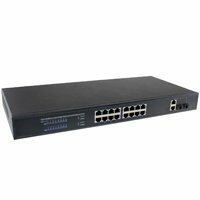 The POE-SW-2016-MGT is a 16 port 10/100 switch with built-in PoE on all 16 ports. Each port supplies up to 30W to provide power to IP cameras and other PoE capable devices. 2 x 10/100/1000Mbps uplink ports are also included to allow you to plug in routers, NVRs, or for expanding your network. For installers looking to extend longer distances, a 2 port 1000Mbps optical fiber SFP module is included. The POE-SW-2016-MGT also features Auto MDI/MDIX support, IEEE 802.3x full duplex flow control support and 2kV lightning protection. A web management interface is also included to provide real-time port status monitoring as well as allowing control of PoE power for each port. The switch receives and forwards traffic seamlessly with its non-blocking wire speed. Every port simultaneously supports up to 200Mbps of bandwidth in full duplex mode. If you have any questions about this product by PIMG, contact us by completing and submitting the form below. If you are looking for a specif part number, please include it with your message.